So I played a bit with the LG 360 cam and like to share my thoughts with you. If, after reading this review, you’re also interested in creating 360° content, you can buy the LG 360 Cam on Bol.com. The packaging in which the camera comes is small and contains in addition to the camera, which itself is also small, a USB cable and booklet with manual in several languages. There is no charger or memory card included. The camera has already been partially charged, but I fully charged it before I started playing with it. The camera has no internal storage, so you really have to insert a microSD card to make even a single photo. I put in a SanDisk Extreme 64GB because I thought 360° video would cost a lot of storage, more about this later. You take a 360° or 180° photo by briefly pressing the camera button on the front of the camera. If you hold the button a little longer, the camera starts filming, then a short press stops this filming. In 360° mode, the movie is saved in an intermediate format with the round images of both cameras side by side. This intermediate format can then be converted to a final 360° movie on your telephone or PC. The camera does not make a 360° movie that you can use immediately. When using the Android App, the intermediate format is converted during the download. This makes the download to take a long time. To convert the intermediate format on the PC, it has to be downloaded to the PC and then a new file is created with the final 360° movie. You therefore you need to have enough storage on your PC because the movie has to be stored twice in order to get to the end result. About the 180° mode, this is actually a cut out of the image of one of the cameras, the optical distortion that you would expect at a 180° image is not present, and that is because a part of the image is thrown away. I have not found a function to adjust this. The image quality of the photos and movies is good in daylight, but in the twilight there is a strong noise at the edges of the lens, and on a 360° photo or video the noise is clearly visible on the transition that is made from one lens to another. The maximum length os a movie is 20 minutes, actually quite short and limited by the firmware, not by the available storage. Via the software “360 Cam Manager” you can connect to the camera and also make a photo or movie that way. You can also switch between 360° and 180° mode via the app and adjust a number of settings. The app can not use external storage, and you are therefore dependent on the available storage on your phone, this can certainly a restriction. Of course you can also view photos and movies with the app, but the app does not support Google Cardboard, which is a missed opportunity. The app also gives the possibility to update the firmware of the camera, but because the camera is connected over WiFi to the phone, downloading the firmware is done via your 3G/4G connection. Certainly something to take into account if you have a limited data bundle. On OS X the camera is difficult to access. On the website of LG you can download a USB driver, the LG Bridge software and the LG 360 CAM Viewer, these appear to be of very limited functionality. To start with the USB driver, you do not have to install it. Only after the uninstalling the driver I was able to access the camera. If you connect the camera with the USB cable the camera storage does not mount like any other USB storage and you can not access the storage of the camera out of the box. You first need to install Android File Transfer and transfer the files via this application to your computer. That is quite a bit cumbersome. With the LG 360 CAM Viewer you can convert files that you have transferred via Android File Transfer to your PC to a final 360° movie. The Viewer can not communicate directly with the camera to access the intermediate files. You should therefore have enough space on the PC to be able to save the intermediate and the final file while the intermediate file is also still on the camera. That can add up, especially if, like me, you only have a 128GB SSD in your MacBook. A microSD card reader solves the problem with the double storage. 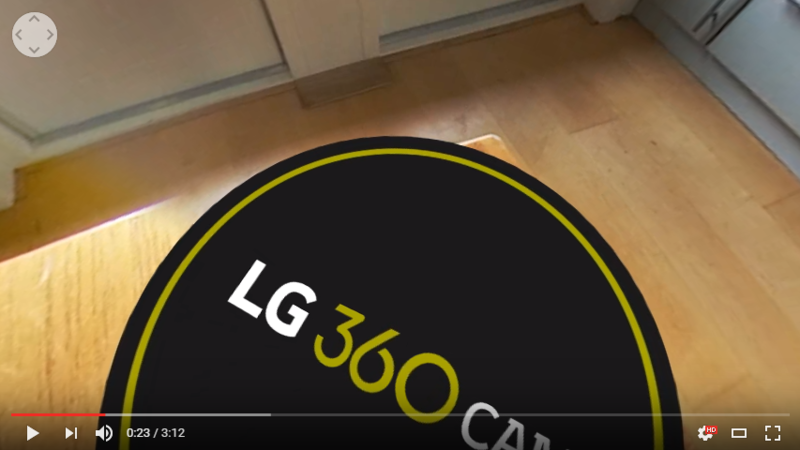 When converting the intermediate format, the LG 360 CAM Viewer puts a large LG 360 Cam logo on the “floor” of the image and thus throws away a part of the footage to advertise a product that you have honestly bought, very unfortunate! If you use the app on Android this is not the case, there you just see footage of the floor and the logo is missing. I’m going to try the camera the next 4 weeks in Panama and Costa Rica, the results can be seen in my blog posts. In a newer version of the LG 360 CAM Viewer software it is possible to disable the logo on the bottom of the footage. By default, the software asks you every time if you want the logo on it, but via the menu “Help” > “Add Logo to Videos” you can permanently disable the logo and the question is no longer asked.